It’s that time of year again. When people look at what they accomplished last year and what they want to achieve in the year to come. 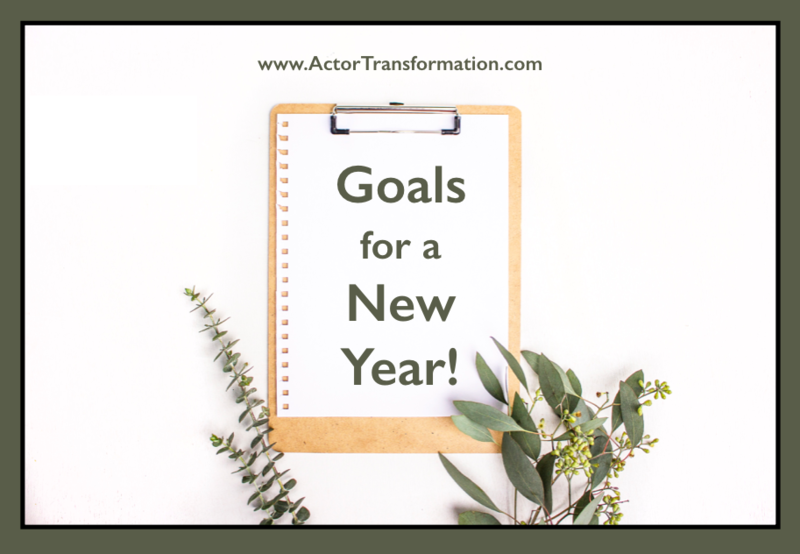 Goal Setting is a very important topic yet few actors take the time to really understand why they want what they want and then devise a real strategy on how to get it. Therefore, for most actors, the current year will look very similar to the year before. As emotional artists, actors often might not want to deal with the analytical side of their business. But it is indeed a very important part of being successful. Seems simple enough. However, many goals lack clarity or are not set up to be successful.. “Get an agent” is really more of a milestone. It is a step towards your real goal which will probably be some variation of “Book quality paid acting work”. An example of a better take on the common agent goal might be: “Research and contact 10 new targeted theatrical agents in the next 14 days.” The shift in words puts the success of the goal in your hands instead of other people or outside sources. Also be detailed when discovering your “WHAT”. “I wanna be rich” is not a great goal because the definition of rich changes as someone acquires more money and is defined differently by different people. Choosing a specific dollar amount by a specific time, will go a lot further. Take some time to work on WHY you want what you want. The desire to be ” rich and famous” will not take an actor very far once they settle in to the daily reality of searching for acting work. Many actors carry a constant goal with them to “get an agent”. And when they get an agent, the goal shifts to “get a better agent”. The problem with that as a goal is that there is an underlying belief that a brilliant acting career is just around the corner… when you finally can get someone ELSE to do the work. Instead of that philosophy, one might be better served by adopting the belief, that getting your team together (Agent, Manager, Lawyer, Publicist, Mentors, Fans, etc) is just a tiny piece of the puzzle. A true actors career at every level, is still up to the actor. The WHY question is often overlooked. but many people in the entertainment industry who are “successful” on the outside find themselves quite unfulfilled on the inside after they reach their goals because as it turns out, the goal was not what they really wanted after all. Many people might think they want to be rich and famous but what they really want is the security and love that they believe wealth and fame will provide. These kind of misfired goals can lead people on very wrong life paths. Long story short? Know why you want what you think you want. WHEN will you reach the goal? It is very important to have a deadline. To achieve big goals…have big deadlines. “In the future”, or “someday”, is often saying “never”. Giving a goal a deadline and putting it on your calendar, will give it wings. Knowing “HOW” to reach your goal is not important while setting it. Some actors have an immediate edit button that stops them from achieving goals because the goals are stopped before they ever begin. It is alright to not know the answers. You will figure it out as you go. But fear of the unknown or fear of failure is no reason to not set a goal. And it is vitally important to give yourself deadlines for all goals, big and small. WHO will you tell about your goal? There is always more to do in an actors career. It is never over. Taking a look back at the goal you just accomplished or the many things you have accomplished in your career is vital. Remember that everything you have achieved in your career up to this point was at one time brand new to you. You had to learn, step by step how to do what now is second nature. So now it is on to the next level. Stretch yourself. Burst out of your comfort zone. The goals that might seem scary now will soon seem easy. There are many more wonderful actor treasures right around the corner, you just have to get out there, set your goals, and go and get them!